I didn't even know we had a toad in the garden until I was out cutting the grass and this little chap leapt out from what seemed like 'under' the Flymo. So the gardening was abandoned while I went and got my camera, then lay down in all the grass clippings to get a few shots of him. I thought this was really cool. Excellent macro, great colors, and then to catch the shiny reflection was an added bonus. Great photo. This shot stood out in the challenge and garnered a nice vote from me. Very well done! That's it. I'm selling my copy of that lens. It simply can't do this! It can't be the photographer - oh, no. It must be the lens. (Mostly it's that I can't hold it still enough to get shots like this.) Lovely guy, by the way. I'm quite fond of amphibians and reptiles and such. Woot! Very nice finish, Steve! And what a fantastic image! Congrats. that lens is unbeatable isn't it? Congrats on your high finish, mate! is 'toad' his name, or is he just some random toad you happened to come across in your yard ..??.. lol .. This is so great, the clarity and DOF are first class. Excellent work, Steve. 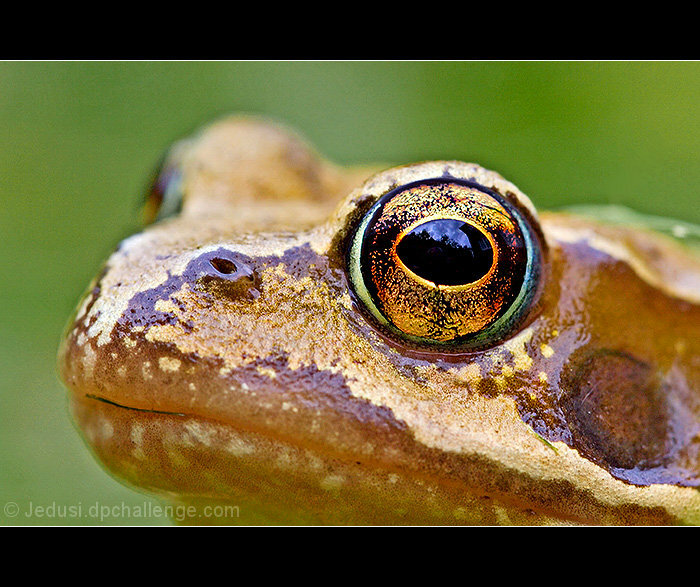 great closeup of the toads eye!!! Photo is terrific. Letter box framing, IMHO, detracts. Fabulous closeup. He's so colorful and striking.I really like the black frame it makes the color of the frog even more intense. Super sharp and very cool! My pick for #2. What an interesting eye! Nice photo. Proudly hosted by Sargasso Networks. Current Server Time: 04/26/2019 07:40:44 AM EDT.